The staff at Harbor City Elementary School in Melbourne, Florida, knew they had to do something different at the start of the 2016–2017 school year. The school had received a C grade on the 2016 Florida Standards Assessments (FSA) tests, missing a D by a mere point. The school was one of the lowest scoring in its district, and students were particularly weak in math. “We knew if we kept doing the same thing over and over again, we were going to get the same results or worse. We knew it was time for a change,” Title I Coordinator Matt Tingle said. After reading a very positive review of Eureka Math on EdReports.org, the independent nonprofit that reviews math and English language arts curricula, Tingle learned more about Eureka Math on the Great Minds website. He discussed adopting Eureka Math with Principal Joy Salamone and in October 2016 introduced the curriculum to the teaching team. 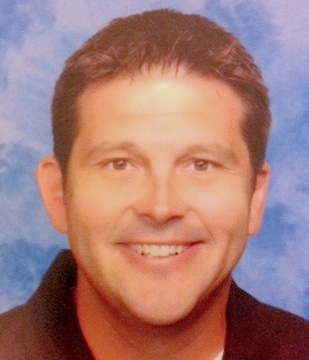 In his presentation, Tingle gave teachers a wood block, a flathead screw, and a Phillips screwdriver and asked them to turn the screw into the block. The teachers said it wouldn’t work. So he handed them a flathead screwdriver: the right tool for the job. Within six months of Harbor City Elementary’s shift to Eureka Math, its students showed tremendous improvement. 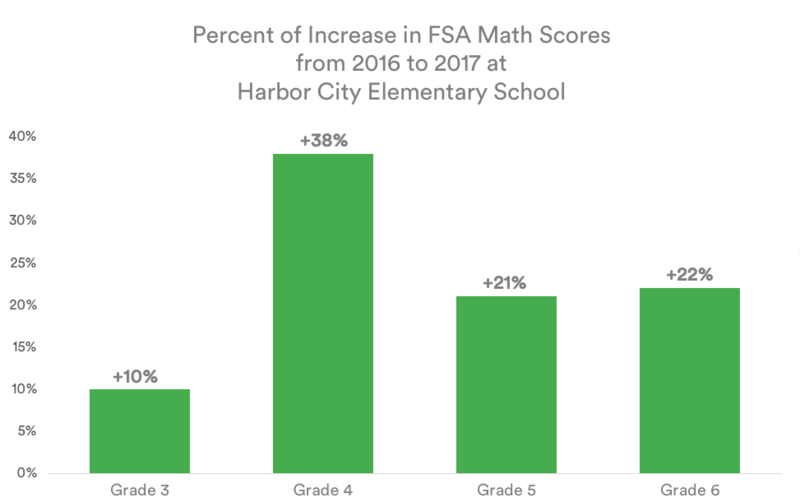 In fact, in the 2017 FSA tests, Harbor City Elementary posted the most growth in math for any school in the district: Year-on-year gains ranged from 10 to 38 percent. The school just missed earning an A by three points. More important, the teachers said, the students really came to understand math deeply and enjoyed it. The great resources in the curriculum and its immediate positive results transformed teachers as well. “I’ve been at this school a long time,” Grade 4 teacher Elaine McCormack said, “and we have seen our math scores go lower every single year. When you get to a certain point, it’s embarrassing. You get angry. So when Matt introduced Eureka Math to us, and we saw that there was all of this material available and a different way of presenting it—and we found other teachers in the county who had started using it and would share ideas with us—we knew we had the support we needed. It was like going from feeling really beaten down to seeing light at the end of the tunnel. He said Eureka Math and better instructional practices have made math classes at Harbor City noisier than they used to be—and that’s a good thing. “What I notice when I go into Elaine’s class, for example, is the way the kids are talking about math and demonstrating their really deep understanding of the concepts,” Tingle said. Grade 2 teacher Susan Dike said the curriculum has helped her students gain much stronger number sense. She says they now know what numbers mean and how they relate to each other. She especially likes how Eureka Math has suggestions for working with numbers that end in 9, like 29, 39, and 49. “Eureka Math taught me to tell the kids that the number 1 is the partner to 9. It gets us to the friendly number 10,” she said. Grade 4 teacher McCormack said Dike’s experience will pay off for her, too. “When my current fourth graders were in second grade, they didn’t use Eureka Math. And what we’ve found is that their number sense, typically built in the earlier grades, is lacking. But now that the children are getting what they need earlier, they will come to me with a better understanding,” McCormack said. The Harbor City team acknowledged some early challenges in the transition to Eureka Math. One challenge was that not every teacher made the change that first year. The students of those teachers lagged behind the others, and that was enough evidence to move the entire school to implement Eureka Math enthusiastically in this 2017–2018 academic year. Pacing was another challenge. Over time, the teachers’ understanding of the curriculum helped them know what to emphasize and where to pull back. To promote coherence, topics in Eureka Math recur periodically in the modules. Knowing that topics would reappear as they taught the curriculum, teachers learned that they could spend less time initially on a topic if necessary. Formative assessments showed month-on-month growth throughout the year, which also gave teachers and administrators confidence in their direction. “One teacher told me, ‘I never really taught math before. I didn’t know that, though, until I saw this curriculum.’ That opened my eyes,” Principal Salamone said. Harbor City Elementary School is a K–6 public school of Brevard County School District in Florida. “One teacher told me, ‘I never really taught math before. I didn’t know that, though, until I saw this program.’ That opened my eyes." "Kids are talking about math and demonstrating their really deep understanding of the concepts."